Feels strange that I’m flying to the US tomorrow as I sit here glued to live feeds from Hurricane Sandy. I’m due to arrive in Dallas on Wednesday afternoon, then fly straight to Atlanta. But it probably depends how far inland/south the storm comes. I’m a bit worried as I’m due at a conference at the University of West Georgia, in Carrollton, by Thursday evening. I’m also going to in NYC on Saturday, but with the volume of flights they’ve had to cancel, I wouldn’t be surprised if that one gets delayed. I’ve never been to New York, and I hope when I get there it’s still intact… I’m feeling for all the people on the east coast, particularly those who may be separated from loved ones. Must be pretty damn scary. The conference I’m going to is called Systems of Control/Modes of Resistance, and I’m giving a paper called: ‘”All can be and will be commodified”: bottom-up resistance and corporate incorporation in Dana Spiotta’s Eat the Document‘. 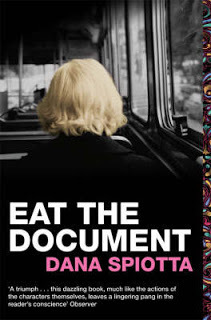 Eat the Document is set in two eras—the 1970s and the 1990s—and there is a comparison between the way the characters in each era protest or resist corporate power. I argue that while the actions of the ‘radical’ protesters in the 1970s may have failed, the small, peaceful movements of the 1990s characters often only confirm, or conform to, the systems of power in a market-based society. 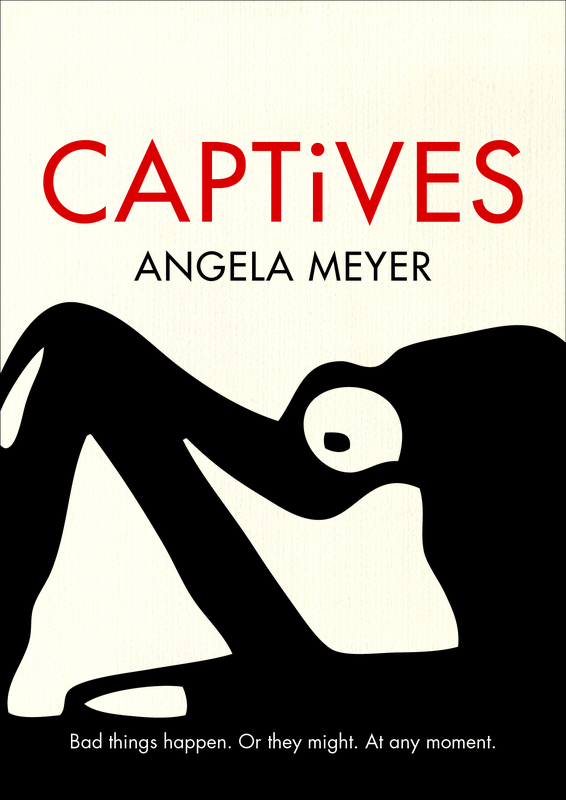 I think the novel is pretty pessimistic, overall, about our ability to resist a culture that readily incorporates, pre-empts and commodifies resistance, but there is one character who remains hopeful, so she provides a contrast. It’s a great read, by the way, I highly encourage you to pick it up (my 2008 review is not very well written, but gives you more an idea of the story). I’m finally going to read Spiotta’s Stone Arabia, too, on the plane over (see James Bradley’s review of that one here). And that gives you a bit of an idea of what I’m writing about in my thesis, too, something I’ve rarely talked about on LiteraryMinded. I guess because until now (where I have a complete draft of my novel and a very rough draft of my exegesis) I was very much still in a process of ‘working out’. There is also the case that in the academic world, you have to present original ideas to the examiners, so you can’t go spilling them out willy-nilly. When I’m finished, though, I do hope to write some more accessible-style essays for non-academic publications, on the subjects I’ve been looking at. And I’ll write more about the whole process of doing a DCA, here on the blog, when I’m finished in March. I’m looking forward to the conference, not just listening to the papers (which all sound fascinating), but the Southern accents! And I look forward to eating some grits and drinking sloe gin. I’m sure I’ll have internet here and there, so I’ll send you a missive. I’m back in Aus on the 13th of November. All the best for your trip, Angela. I hope the East Coast has dried out by the time you get there and everything is okay. Travel safe. John. I know of a local author over here in Perth who is currently stuck in NYC while Sandy makes everything nice and soggy. At least your conference wasn’t scheduled for a week earlier. Grits might have made it onto the buffet tables of the USA by now. Here’s hoping. Not only that, but you can get swept up in the election hype while you’re there (but only if you feel like it. Might depend on the result.) In any case I hope it all goes well and that your paper goes down a treat. Sorry about your friend! I hope he/she is safe. Wow, my friend Kent (ex-pat American) told me I should try grits. I hope that doesn’t happen to me. Sounds like a very strange experience indeed! Oh fun fun Angela. having lived in the USA twice – two years in Virginia and, a few years later, three years in California I can attest that you’ll have a ball. Atlanta is a great place – Gone with the wind, Martin Luther King, and all that. Enjoy giving your paper. We look forward to reports on your return. Good luck with your conference Angela, and safe travels! Hi Angela, your thesis sounds interesting, and I’m intrigued by what you say about radical movements failing in the 1970s. Did we fail? We stopped the Vietnam War, we had many environmental gains and there were huge reforms for women, and one way or another all of these involved tackling corporate power as well as governments. *smile* I guess I will have to wait till your thesis is published to find out more! Hi Lisa, that part is specifically in relation to the way the characters are portrayed in Spiotta’s novel (but they still are seen as having done ‘something’ rather than just projecting an ‘idea’ of resistance). This specific set of characters did ‘fail’ (though that’s a loaded word) because their actions unintentionally caused harm to someone innocent. The overall thesis doesn’t compare the ’70s gen so much, it more focuses on the last 20 years: why & how some people resist (norms of consumer society) & whether they actually *do*. But I will have to go into depth more here at some point! Wow, I’ve never had a conversation with anyone up in a plane before! I’m fascinated by how resistance has changed in my lifetime. When I was a young woman everyone I knew was involved in some sort of grassroots kind of activity, but things are not like that now. We often hear judgemental remarks about how disengaged later generations are, usually followed by defensive explanations about the cost of living, insecure employment and so on. I’ve always thought there was more to it than that, and I’m pleased to hear that you’re exploring this in a more sophisticated way. BTW I just read your interview with Annabel Smith: I’ve just finished reading her new novel Whisky Charlie Foxtrot and am ‘blown away’ by how good it is. I’m trying not to gush in my review! Your thesis topic sounds really interesting – and those are some of the ideas explored in your novel I’m assuming? They are, Annabel. It’s set in the near future. I’m very interested by near-future settings. My third novel is set in 2041. Have you read meg Mundell’s Black Glass? That touches on some similar ideas to yours perhaps. I’ll look forward to reading yours when you get that cigar! I have indeed: https://literaryminded.com.au/2011/02/26/the-moody-city-mug-mundell-on-black-glass/ That’s cool that yours is set in 2041. Mine is probably slightly later than that but I was reluctant to put a date on it as it’s really about now (though what spec fic novel isn’t?) Every bit of feedback I get is different, but there’s always a lot that is positive, so that’s good. How far along is yours? Good interview. I really liked the book. I’m a hair’s breadth away from a second draft. I’m actually hoping very much to finish before Christmas – fingers crossed. You? It’ll depend how my current submission goes! If it’s a no, I will consider a rewrite before sending it out again. Close to finishing a second draft, that’s exciting! Well good luck with it. Yes, I’m very excited. It’s taken me a year to rewrite it, because I’ve mostly been focused on Whisky Charlie Foxtrot.